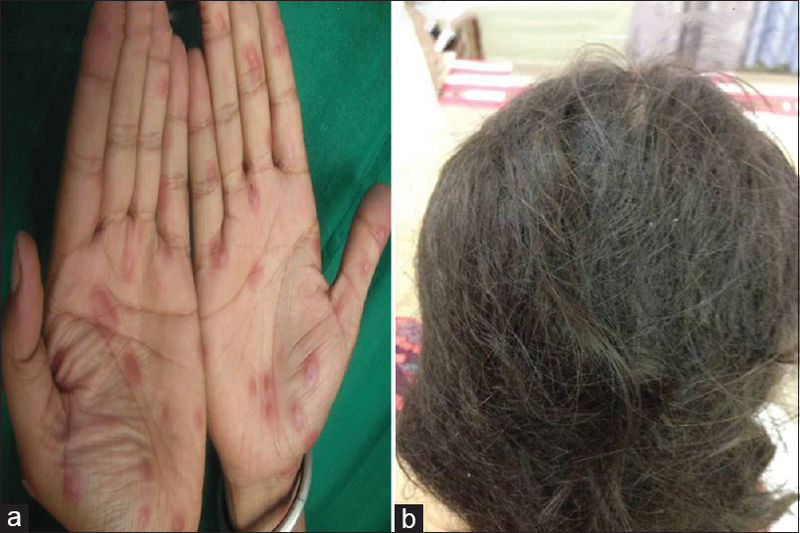 A dermatology consult was sought for a 65-year-old female who developed severe matting of scalp hair for 1 week. She was admitted under medical services for the management of azathioprine (50 mg once daily for a month) induced pancytopenia, which was prescribed for pulmonary sarcoidosis. She gave a history of loss of hair from frontal area of scalp, that came out in bunches, followed by spontaneous tangling of hair over the top of her head to form a stiff protuberant mass [Figure 1]. She denied shampooing the hair immediately prior to this. She had no features of scabies or lice and shampooed her hair once a week with a non medicated shampoo. There was no history of use of any chemical treatment for her hair such as streaking or straightening of hair. There was no associated pruritus or pain. She had no psychiatric comorbidity and was not emotionally and physically neglected. Examination of scalp revealed diffuse non scarring loss of hair over the frontal area and a mass of solid irregular matted hair located over the vertex, approximately 10 cm in height [Figure 1]. There was no foul odor, nits, or crust formation. Investigations revealed total leucocyte count of 0.9 × 109/L (reference range 4.0–11.0 × 109/L), hemoglobin of 7.4 g% (reference range 12–15.5 g%), and platelet count of 0.49 × 109/L (reference range 1.5–4.5 × 109/L). Examination revealed noncicatricial hair loss over the frontal region and elongated stiff protuberant mass of matted hair on the vertex which could not be detangled. Hair pull test was positive with anagen hairs. Microscopic examination revealed ragged irregular breaks in the cuticle. Pancytopenia was managed conservatively, and scalp hair were removed. A 30-year-old female was referred for the sudden loss of hair and severe tangling of hair that could not be combed for 3 days. Her medical history was significant for the development of hydatidiform mole followed by methotrexate induced pancytopenia, severe stomatitis, and erythema multiforme over hands, feet, and upper trunk [Figure 2]a. She was on methotrexate 25 mg once a day for 5 days, two cycles given over a period of 1 month. During her hospital stay, she found difficulty in combing her hair that became extensively tangled. 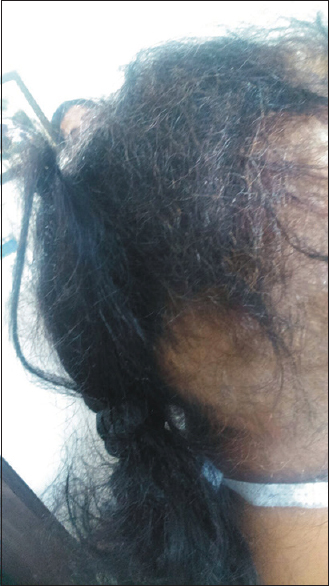 Over next few days, she tried to comb her hair without success and found that her hair had been irreversibly matted and also the loss of hair over frontal area of scalp [Figure 2]b. There was no history of skin or hair disease in past, and she regularly shampooed her hair once or twice a week. She was emotionally stable. Pertinent investigations revealed total leucocyte count of 1 × 109/L (reference range 4.0–11.0 × 109/L), hemoglobin of 8 g% (reference range 12–15.5 g%), platelet count of 0.55 × 109/L (reference range 1.5–4.5 × 109/L) and peripheral blood film predominantly normocytic normochromic. On examination, she had extensive noncicatricial alopecia involving the middle two-third of the scalp. An elongated, stiff mass of tangled hair extending downward was present. Hair pull test was positive. There were no signs of parasitic infestations or poor hygiene. Under light microscopy, the matted hair showed hair shaft fractures. She was managed conservatively for pancytopenia and scalp hair were shaved off as a part of treatment for plica. In 1884, when Le Pagefirst described a case of acute matting of scalp hair, he referred to it as plica neuropathica as he believed it stemmed from hysterical tendencies. Other terms for the same disorder include felting and bird's-nest hair. It was prevalent in Poland in the 19th century, hence was named plica polonica or Polish plait. It presents as a compact mass of scalp hair with irregular twists and irreversibly entangled plaits which are firm to hard impenetrable mass of keratin cemented together with dirt and exudates. Pathogenesis of plica is poorly illuminated. The process of matting is essentially similar to the phenomenon of “felting” which occurs in wool and textile industries in which there is compacting of contiguous fibers exposed to surface damage and friction. It occurs when fibers are stirred together in a liquid medium and are subsequently exposed to increased functional forces. If the hair is rubbed along its shaft, it gets electrically charged with positive polarity if the friction is toward the root and negative if friction is toward the free end. Thus, hair is dielectrically anisotropic at its surface. These differences in electrostatic forces between hair shafts probably enhance the phenomenon of matting. Probably matting of hair does not occur either from electrostatic attractions or from liquid crystal formation but from the combination of the two. The exact mechanism for matting is not well-understood but both physical and chemical factors that damage hair shafts may play a role , [Figure 3]. Various etiologies have been propounded from time to time. A thorough review of the available literature has led to a plethora of causes [Table 1]. Temporary hair loss (alopecia) is a common side effect of chemotherapy. Hair follicles (HF) are “hair shaft-producing miniorgans” showing during postnatal life a unique pattern of cyclic activity with periods of active growth (anagen), relative resting (telogen), and apoptosis driven involution (catagen). HF's are strongly affected by many chemotherapeutic agents because of the rapid proliferative rate of hair matrix keratinocytes during anagen. Immunosuppressive drugs commonly lead to anagen effluvium due to abrupt cessation of mitotic activity in the rapidly dividing hair matrix cells so that either no hair is produced, or a narrowed and defective hair shaft is produced and the hair loss is evident within days to weeks of drug administration. However, azathioprine is not normally known to be a cause of anagen effluvium and it is possible that the sudden pancytopenia results in hair shaft damage leading to hair loss and hair shaft cuticular damage resulting in matting of hair. Plica neuropathica generally affects healthy persons but has been described in a 54 years and a 14-year-old chronically ill female with azathioprine-induced pancytopenia, without any history of neglect, parasitic infestation, and shampooing., On the other hand, methotrexate has not been reported to cause matting of hair though it can lead to hair fall. Antimitotic chemotherapeutic agents such as methotrexate induce arrest of the anagen phase and present a toxic insult to the rapidly dividing hair matrix. Hair loss usually begins 1–2 weeks after chemotherapy is started and is most noticeable by 1–2 months. The scalp hair is usually most affected. In both of our patients, there was a loss of scalp hair along with matting of hair. These antimetabolite drugs induce dystrophic changes in the new follicles as well as in the already growing HF. They also lead to premature regression as a result of massive apoptosis in the entire proximal hair bulb leading to subsequent hair shedding. When functional forces are applied to the already damage cuticle of the long and old hair, proximity of shafts increases, and tangling occurs leading to plica. Furthermore the unfruitful efforts by the patient to comb the unruly hair lead to electrostatic attraction and increase the chances of matting of the long and old hair. The chemotherapy-induced hair loss and the effects on the growing HF, and the resultant cuticular damage is much more complex than previously appreciated and may require distinct molecular studies to further collaborate these theories. Historically, plica neuropathica was treated with mercury., Cutting of the matted hair is the most viable option available.,, Both of our patients agreed to the manual removal of hair as a part of treatment. Plica, once developed needs the complete hair removal. However, it can still be prevented from developing by adequate hair care and washing habits. Long hair should be given a backwash or be washed in the sink. Matting of hair in two patients on azathioprine , and in a patient on chemotherapy (Doxorubicin, cyclophosphamide and cisplatin after surgery for papillary cystadenoma ovary) following washing of hair with a soap containing acacia concinna, have been reported previously. 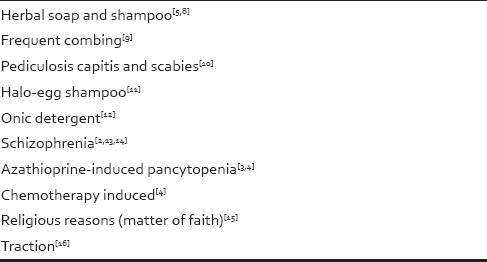 The current report is probably only the third case of plica neuropathica associated with azathioprine-induced pancytopenia andfirst with methotrexate in literature and unusual in that it occurred not because of neglect and poor hair care or overzealous shampooing of hair but due to cuticular damage of hair shaft secondary to the immunosuppressive drug induced pancytopenia. We consider that matting of hair is not truly a hair disorder, rather a reaction resulting from the interplay of great motley of factors. Moreover, the role of myriad factors such as chronic illness, hospital stay, pancytopenia, and drug induced cuticular damage is still debatable. Kumar PN, Antony B, Chakravarthy A, Koyamu AM. 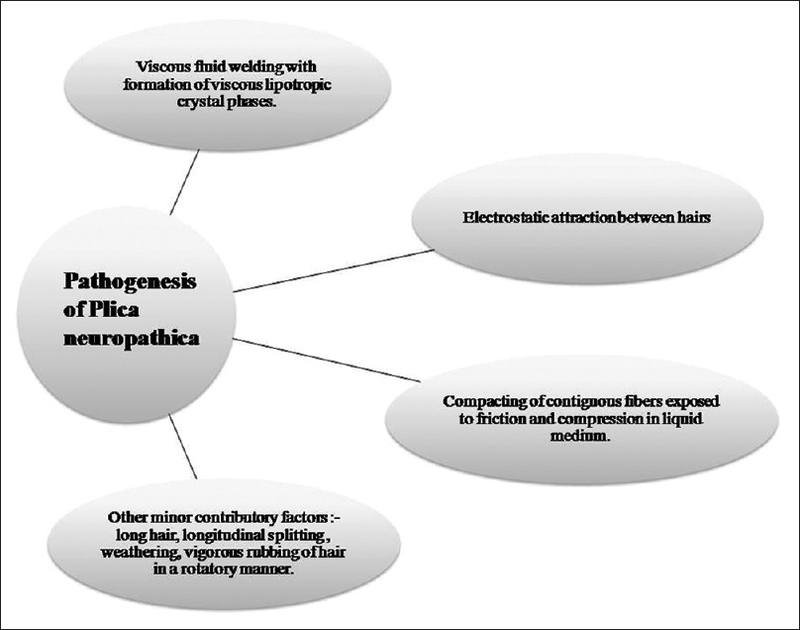 Plica neuropathica (polonica) in schizophrenia – A case report and review of literature. Indian J Psychol 2001;43:281-3. Kwinter J, Weinstein M. Plica neuropathica: Novel presentation of a rare disease. Clin Exp Dermatol 2006;31:790-2. Al Ghani MA, Geilen CC, Blume-Peytavi U, Orfanos CE. Matting of hair: A multifactorial enigma. Dermatology 2000;201:101-4. Zawar VP, Mhaskar ST. Matting of hair following use of a new herbal shampoo. J Cosmet Dermatol 2003;2:42-4. Gnanaraj P, Venugopal V, Pandurangan CN. Plica polonica in association with pediculosis capitis and scabies – A case report. Int J Dermatol 2007;46:151-2. Mani ZM, Sahni SP. Matting of hair due to halo-egg shampoo. Indian J of Dermatol, Venereol, and Leprol 1983;49:138-46. Sharma PK, Saxena AK, Jain RK, Sharma AK. Matting of the hair due to onic detergent. Indian J of Dermatol, Venereol, and Leprol 1987;53:179-80. Pruszyński JJ, Putz J, Cianciara D. Plica neuropathica – A short history and description of a particular case. Hygeia Public Health 2013;48:481-5. Bhatia A, Kanish B, Chaudhary P. Plica neuropathica (Polonica) – A matter of faith. Int J Sci Stud 2014;2:91-2. Botchkarev VA, Komarova EA, Siebenhaar F, Botchkareva NV, Komarov PG, Maurer M, et al. p53 is essential for chemotherapy-induced hair loss. Cancer Res 2000;60:5002-6. Susser WS, Whitaker-Worth DL, Grant-Kels JM. Mucocutaneous reactions to chemotherapy. J Am Acad Dermatol 1999;40:367-98. Trüeb RM. Chemotherapy-induced hair loss. Skin Therapy Lett 2010;15:5-7.